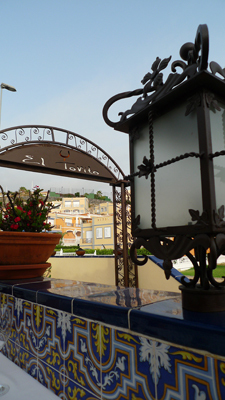 Or was it El Torito … Anyway, don´t know, but it´s been the nicest restaurant we´ve been to in Costa Adeje, Tenerife. Okay, 1 of 3 restaurants we´ve enjoyed. But they´re a walking distance from the hotel which makes them even better. Last night we tried roasted piglet and deer in chestnut sauce. Beautiful stuff. And yes, piglet came with the little tail and the big hoof. Entrees with cripsy baby squid was absolutely delicious. Thoroughly enjoyed our meal. Went there tonight for dinner again. Tried crispy squid and clams in green sauce, with tagliatelle and meatballs for mains. We overdid it last night, so we made sure to order less and managed to squeeze in a cup of coffee and tiramisu. Our Uruguayan waiter was brilliant, so friendly and welcoming to people whose only Spanish words were Hola, and bueno and tres. What´s there not to like about this place. Well, maybe the proprietor, who looked rather stern yesterday, but today managed to break out a smile.